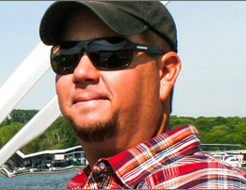 David Hines is Construction Manager for Jen-Hill Construction Materials. David graduated from Middle Tennessee State University in 1999. The 9 yrs before Jen-Hill were spent in the home-building industry. David manages Jen-Hill’s small installation assistance crew. He estimates and oversees installation of all pond liners and repairs, schedules the installs of interior components for our Suntree Technologies stormwater quality units, and specializes in assisting contractors with our technical products.